Welcome to "PatAndClayJacobson.com" your one stop source for all your real estate needs in Trenton, Brighton and the Quinte area. CFB Trenton approved and registered DND IRP (Department of National Defense) relocation Realtors. Looking to purchase a new home? Avoid feeling overwhelmed and use our experience and knowledge to find the home of your dreams. In today's competitive real estate market, timing is everything. Many good homes are sold before they are ever advertised. Beat other homebuyers to the hottest new homes for sale in Trenton and area with our FREE New Listings Email Notification on our Home Search page. Simply register your preferences and you will receive listings via email to your inbox that match your criteria. You can comment on them to help us refine your search or cancel it at anytime. Are you just curious and want to see what is 'out there' that may interest you? Feel free to browse the listings on this page, search for listing by map on the Listings by Map page or search all the MLS listings in the Quinte and District Board area on the Search MLS Listings page. You do not have to provide us with any contact information to access these pages and we will not contact you until you are ready. And when you are, please let us know how we can help you. Thinking of selling? Exposure is everything. Leverage our experience and marketing tools to turn 'selling' into 'sold'. We subscribe to a powerful online network that connects real estate professionals with one another and with the most important real estate advertisers on the web. This service allows us to not only advertise your listing on the national MLS system and our website but also on over 50 of the busiest online real estate marketplace websites in the world. We would also be more than happy to provide you with a FREE Home Evaluation. We sell real estate but our real business is People. 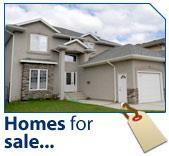 Whether you are buying or selling a home, hire someone like us, who wants to earn your business. We invite you to contact us as we would be happy to assist you with this important transaction. Have questions? We're here to help find answers to your real estate questions and to provide insight into the local real estate market. Browse these homes for sale in Quinte West, Trenton, Brighton, Belleville, and the surrounding area to find the perfect home! View virtual tours, send my listings to family and friends, and use my exciting map search! Can't find what you're looking for? No problem. Try my Home Search absolutely FREE! Not only will you be notified by email of all our new listings that match your search criteria, but your homes search will find other featured homes for sale in Trenton by other local real estate agents.